Blues is My Middle Name: Two Nationals - but are they Grand? Two Nationals - but are they Grand? On the weekend just passed, I broke the habit of around 30 years and watched two events that are classed as the greatest in the sporting calendar. One event was in England, and was the Grand National horse race, and the other was in America - the Augusta National, better known as the US Open Golf Championship. I'm no lover of horse racing or golf, but for some reason I tuned into both. The Grand National is held at Aintree Racecourse, Liverpool every year as part of a three day racing festival. It was first run in 1839, and this year's race was the 164th National. It is estimated that 600 million people worldwide watched the race on television, with about 74,000 at a sold out Aintree. Bookmakers say that £250 million was bet on the race. The picture shows the eventual winner, Ballabriggs. I tuned in to the BBC about 30 minutes before the start of the 4.15pm race. The 40 horses and jockeys were paraded around as they made their way to the start. The horses did look in fine condition (I'm just repeating others here, as what do I know?) and it was a spectacular sight. The starter certainly earned his money by getting the race underway first time. The Grand National is two circuits of the Aintree course, and there are 30 fences to jump. 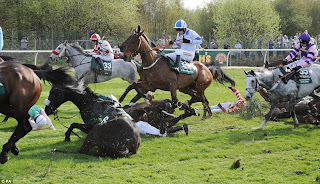 In the end, for the first time ever I think, only 28 fences were jumped, because two had to be avoided because of two horses who had died, and were covered with tarpaulin until the race finished. One horse had broken its neck in a fall, and the other had broken its back. We only found this out later. 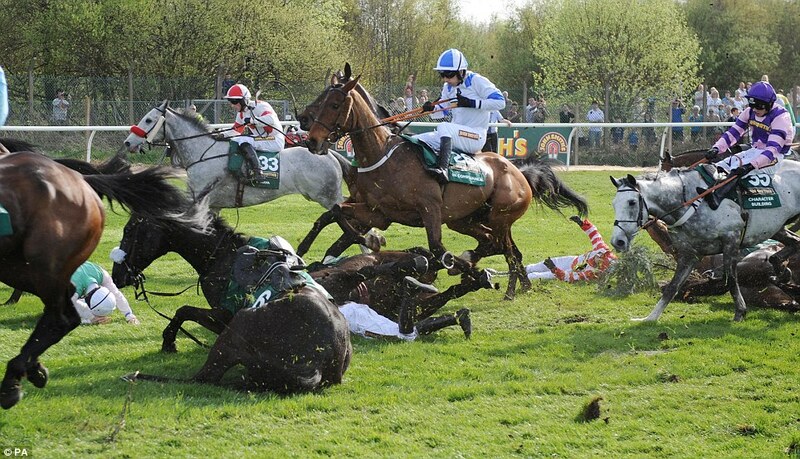 Just over half the horses failed to finish the race, due to either falling, or being pulled up by the jockey. In the run up to the finishing line there seemed to me to be excessive use of the whip on the horses' rear ends. I've said a number of times in my blog that I'm not an animal lover, but neither do I like to see animal cruelty. In the last eleven years, 33 horses have died in the three day Aintree 'festival'. This is an average of three a year - is this acceptable? In addition, following a fall in the 2.15pm race, the jockey Peter Toole was placed in a medically-induced coma, and is fighting for his life as I write this. Peter Scudamore, who rode in the National many times, but without winning it, said in today's daily mail on-line, "I love the Grand National - but this was agonising to watch. The Grand National has always been a dangerous and potentially deadly race, and jockeys accept that: the risk, both to their horse and themselves, is part of the job". Jockeys have a choice; horses don't. The League Against Cruel Sports have consistently asked for this race to be banned, but it is unlikely to happen, as there is too much vested interest. However, can we just allow a few days of regret, only for then to carry on as if nothing has happened? The world is not a better place for the National, and it wouldn't be a worse place if there was no National. Perhaps there are too many horses, and too many fences. Some people say that to reduce either, will make the race like any other national hunt event, and that the risk is therefore worth taking for the 'spectacle'. If only there was a way of canvassing the views of the horses. Following the trauma of Saturday's Grand National, I tuned in on Sunday evening to watch the BBC's coverage of the closing hours of the Augusta National Golf Tournament - the US Open. No one died or was injured through playing golf, though a great deal of damage was done to some ego's. I tend to side with Mark Twain when he said, "Golf is a good walk ruined". Augusta is undoubtedly a magnificent place. I would love to walk around it, but it's a private members club, so golf is the name of the game, not walking. Why did I sit for hours on a Sunday evening watching the game? One reason is that I was feeling incredibly lazy, and wanted a non-challenging evening. Another was curiosity to see if the 21 year old Rory McIllroy from Northern Ireland could become one of the youngest ever to win the event (this question was endlessly trailed on TV). He had led the tournament from day one, and came into the final round four shots ahead of anyone else. He was still doing well after the first nine holes, but at the 10th hole it all started to unravel. He had a triple bogey 7 (I hope you're impressed with the lingo here, and I'm grateful to Peter Allis for the information). It got worse, and I confess to feeling for the young man. He finished up 10 strokes behind the eventual winner, Charl Schwartzel from South Africa. This turned out to be 50 years to the day since the first non-American, Gary Player, also from South Africa won the event. I may not love the game, but I can appreciate the skill involved in knocking that small ball into a small hole 72 times in the least amount of strokes over four days. Rory was devastated, but gave an interview with dignity that spoke well of him. Tiger Woods, by comparison was anything but dignified in defeat. Come on Mr Woods, you can't win everything. Charl (as I like to call him, because that's his name) deserved to win, and to get his own green jacket. The event was no doubt a joy to all those who were present, and to millions watching on TV. For me, the game was fine, but I couldn't get out of my mind that the Augusta National Golf Club is everything that I detest in life. It is an elitist private members club that was established in 1933. It only has about 300 members at any one time. Fees are said to be low (though 10,000 dollars a year is beyond the reach of many, but the poor will never get an invite anyway). Membership is strictly by invitation; there is no application process. After years of criticism for being exclusive and discriminatory, it only accepted its first black member in 1990. Women are still not allowed to be members, and even this year a female journalist was prohibited from joining others in the traditional locker room interviews - Augusta did later apologise for this, saying it was down to an over zealous security guard. The US Open is always held at Augusta, so exclusive and discriminatory admissions continue to be tolerated. I'm sorry, it may be a great event, but sometimes there are more important things in life than sport. So, I've watched two nationals, but are they grand? Not for me.